As part of these crazy breakfast spreads, my Nana also used to make us these chicken wings. They're perfectly crunchy, tangy, salty and go great with some rice! 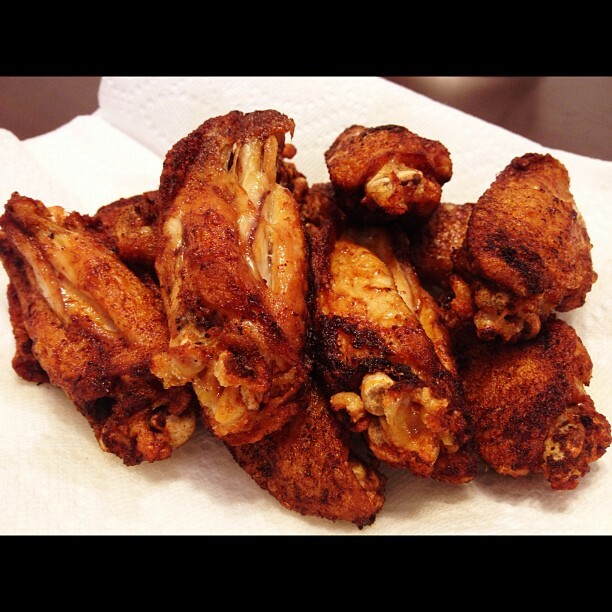 The secret and really only seasoning on these wings is a packet of Sinigang soup base! I usually make these up for my sister or Dad when they're craving it. According to wikipedia, "Sinigang is a Filipino soup or stew characterized by its sour and savory flavor most often associated with tamarind." It's easily found at Asian grocers such as 99 Ranch. I usually use the Sarap brand, it's the most tangy out of all the various mixes I've tested. If you can't find it any Tamarind Soup Base Mix or Mama Sita's Sinigang Sa Bayabas kind works just as well. The recipe depends on how tangy you want your wings to be. I usually use about two packets of soup mix to a pack of chicken wings, which is about two pounds, so it would probably be safe to say one packet of soup mix to every pound of wings you'll be cooking. 1) Fill large pot with cooking oil, enough to cover wings. 2) Set heat to medium and let the oil heat up. 4) Do the water drip test! Take a drop of water and drop it in the pot of oil. If the oil sizzles when the water hits it, it's ready for the wings. 5) Add the wings to the pot, but don't add too many as it causes each batch longer to cook. Try not to move them too much when they're cooking. 6) Let the wings cook in the oil and remove when they achieve a dark golden brown color. 7) Set the finished wings on a plate covered in paper towels so any excess oil can drip off. Ohhh, those look sooo goood. Finally, something I can use my sinigang mix for besides sinigang. I have a ton of packets just waiting to be consumed. My hubby will love these; great alternative to just garlic salt. Oh those look so good!! I need to find an Asian grocery store - I think there is one not too far away!! Yum! Those look AMAZING and are making this vegetarian miss chicken wings SO badly!